The loveable reputation of an iconic children’s TV character is scarred by Postman Pat: The Movie, a big-screen outing that’s dead on arrival. Desperate to take his wife on holiday, Pat (Stephen Mangan) is forced to enter a talent competition, where he becomes an overnight sensation. Meanwhile, his hometown is terrorised by evil robots – something that only Pat can stop. 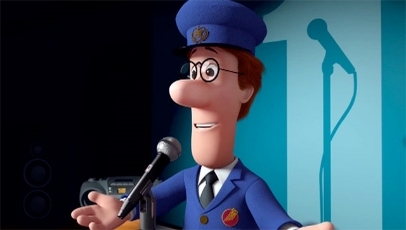 With a scattered tone and risible, lifeless script, Postman Pat: The Movie is a far cry from the charming TV series pre-schoolers know and love. Essentially an ode to Simon Cowell (here Simon Cowbell) and his brand of Saturday night “entertainment” than an actual film, the film drowns under an overcomplicated narrative, the dead-eye effect of unsettling animation and bland characters. A neat opening tracking shot and enthusiastic voice work are the only two plus points of director Mike Disa’s inept reinvention.